Former TV5 anchor Chi Bocobo made her low-key return to the airwaves earlier this month as the newest addition to the One PH family. 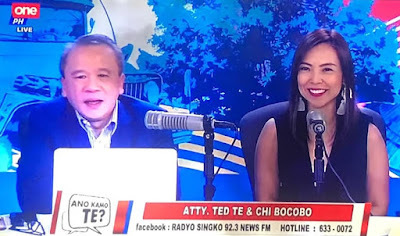 Bocobo, who was last seen on TV almost five years ago, has been tapped as the co-anchor of the new public service program Ano Kamo, Te?, alongside former Supreme Court spokesperson Atty. Theodore “Ted” Te. The veteran broadcaster left the industry in August 2014 after a three-year stint at News5. During her time at the Kapatid news division, Bocobo had served as news anchor to newscasts like Balitang 60 and Andar Ng Mga Balita. Additionally, she was also the lead anchor of AksyonTV's breaking news coverage. Before this, of course, she worked at then-ABC5 as news correspondent and anchor of the early evening newscast Balitang-Balita. She was then known as Ces Datu. Ano Kamo, Te? airs every Saturday at 6-7PM on One PH. For news tips, please use our tip box (click here). You can also send us an email by clicking this link.